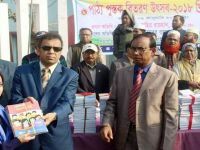 The government is working to develop ethical standards and socio-economic development of the people by promoting a religious culture of Bangladesh and religious sentiments. Alongside, many steps have been taken for the development of Islam. The information was from the Ministry of Religions. A total of 560 model mosques and Islamic cultural centers have been taken up in each district and upazilas in the country with the cost of nine thousand crore rupees. The activities of establishing a total of 1010 Darul Akram Ibtadei Madrasa in every upazila are taken to remote areas which do not have primary schools. Meanwhile, the place for the madrasa has been selected and the process of recruitment of 5,50 teachers has been started. From 2009 to 2017, 9 lakh children and 30 thousand education centers in pre-primary level and 9 001 students, including 29,00,000 simple Quran Education Centers, have covered 1,02,21,000 young people. Apart from the digital version of Holy Quran, different websites have been made. Five-storey Islamic foundation central library building has been constructed at the initiative of Prime Minister Sheikh Hasina at the Baitul Mukarram National Mosque Complex in the capital. About 35 thousand Imams have been trained in various subjects through Imam Training Academy. Four thousand new mosque-libraries have been set up. The number of Hajj pilgrims from Bangladesh increased by 16 thousand this year from last year. An arrangement of one-time help and an interest-free loan from Imam and Muazzin Welfare Trust has been taken. Not only that, under the guidance of temple-based children and mass education programs, about 5000 pre-primary education centers, 800,000 children, morality education and 250 adult education centers have been provided with literacy and religious education for 30 thousand adults. Pagoda-based pre-primary education is being run for the Buddhists at a cost of Taka 3 crore. In the last fiscal year, necessary funds were also allocated for the maintenance of the Christian Religious Welfare Trust. Support is being provided to all sections of the people: The government is providing assistance to all sections of society as per the requirement. In addition to the backward, disadvantaged people, people with disabilities, strangers, grenadiers and even migrant workers are also being assisted. Cash payments are being given to the sick patients. These help-assistants are being assisted by the Social Welfare Ministry. With the help of all the disabled people, currently 103 people with disabilities services and help centers are being managed. Autism and Neuro Development Corners have been established at one of these centers. Providing service through autism resource center established in 2010, combining the expert and multi-disciplinary team. In the financial year 2017-18, 9 thousand 400 students of primary and secondary schools are given Tk 300 in primary level, 450 in the secondary level, 600 rupees for higher secondary level and stipends at a rate of Tk 1000 for the higher level. Apart from this, a similar stipulation is being given to educate the school-going Hijra people. Financial aid programs have been provided to 2,5 553 kidney and liver cirrhosis patients with a financial assistance of Tk 50,000. So far, 25 lakh 80 thousand 33 poor patients have been provided medical treatment through the Hospital Social Welfare Program. Shakib is not against Mustafizad!